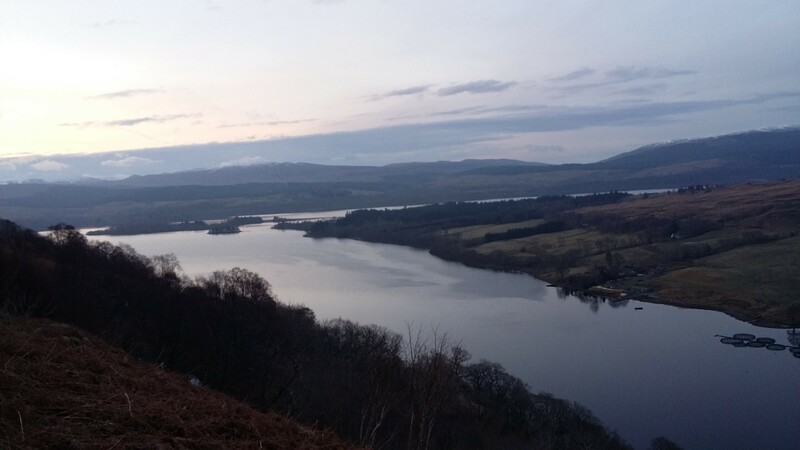 We planned the long weekend trip to Scotland many months ago - partly because, being a Surgeon, Chris can't up sticks at short notice (something - surely relatively unimportant??? 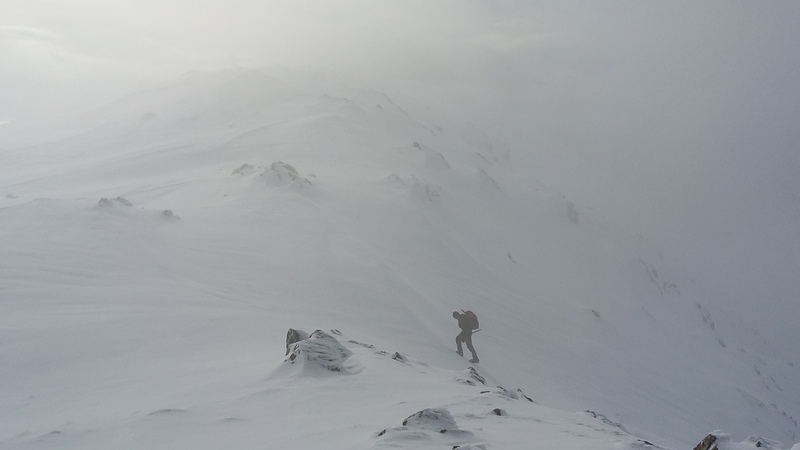 - about lists...); and partly for some other reasons now lost in the mists of time - perhaps something to do with the fact that we'd planned to do the Cuillin Ridge last year in summer, but didn't manage to get it together. Given the pretty horrible winter weather in the Highlands over quite an extended period, the advance planning seemed in hindsight to have been a good move; but when I saw the pictures in reports from the previous two weekends (eg wilkiemurray's amazing report of his overnight on Sgurr na Stri) I began to experience an increasingly neurotic anxiety: surely we couldn't have three good weekends in a row? Suffice it to say that there was a great deal of worried scanning of all the forecast sites and anxious email exchanges in the preceding days! By Thursday - travel day - the auspices were reasonable: for Friday the consensus on the runes sites was for mixed sun and cloud, possibly a bit of snow; and for Saturday, clear skies and sun all day! So, notwithstanding Dr Frank arriving at our pick up spot at J9 on the M62 without his boots (only rescued from disaster in the nick of time, just before starting, by a call from the long-suffering Amanda), we set off in good spirits late on Thursday afternoon, arriving in Tyndrum around 20.00 - M6 traffic conditions are very different on Thursday evening to the usual Friday crawl, thank goodness. Packing our gear into the car the next morning as dawn started to break around 6.30am, the sky was clear, the frost hard, and the decision to make a early start obviously a good one. 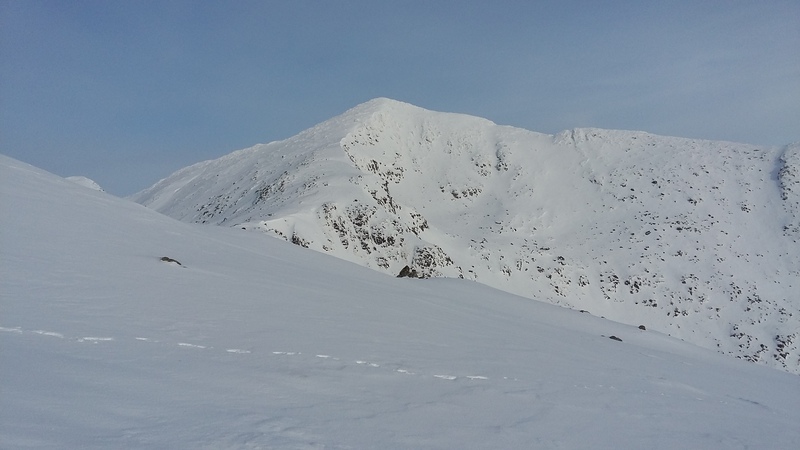 We'd decided on a shorter route for the first day as a kind of warm up - namely, the Cruachan Horseshoe - as none of us had done any significant walking for close to 6 months. Moreover, we had no idea what snow conditions would be at higher levels - I'd read some WHRs where people had been sinking up to their knees - even thighs - in the glorious white stuff (weaselmaster even resorting to crawling on all fours! ); and I well know this is pretty energy-sapping. 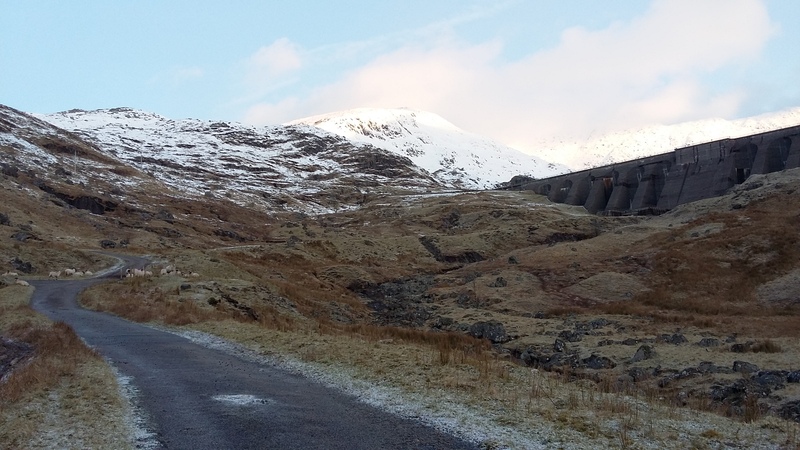 Some 20 minutes later we'd parked up at the Cruachan layby, and were crossing under the pedestrian tunnel beneath the railway adjacent to the Falls of Cruachan station, and on to the path on the upper East bank of Allt Cruachan that leads up to the reservoir. 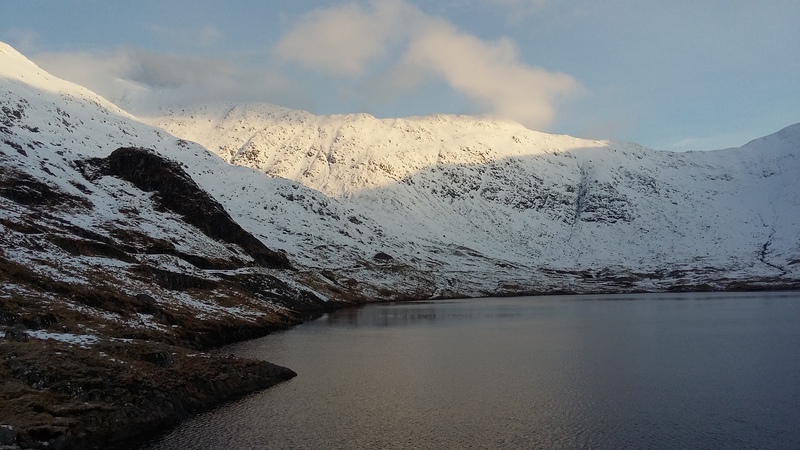 On the way to Cruachan Reservoir, as dawn breaks. 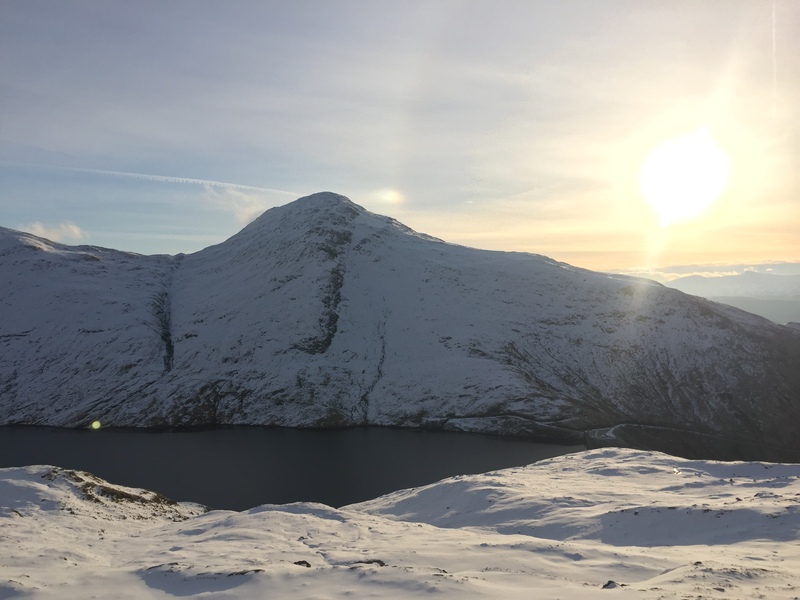 Rather than taking the standard route along the West side of the reservoir, we strike directly up Meall Cuanail, for no reason other than that it is there, and the snow looks sooooooooo inviting! 20160226_084205. 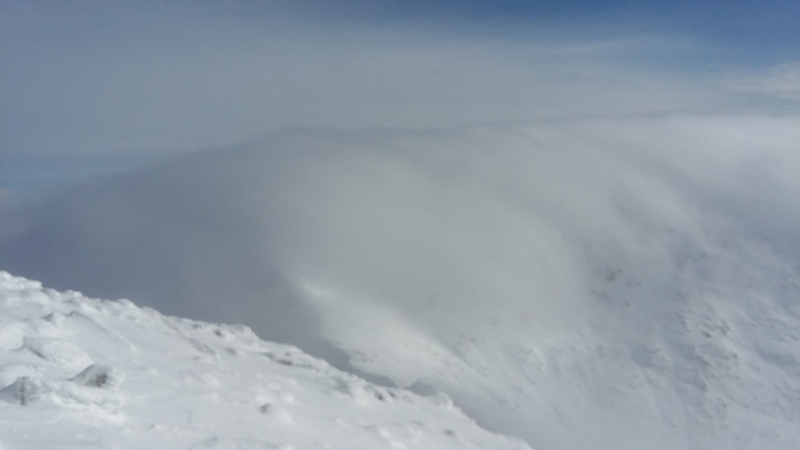 Ascending Meall Cuanail, looking East across at Beinn a' Bhuiridh, and a rather strange and persistent mini cloud formation that looks like spindrift. 20160226_091501. 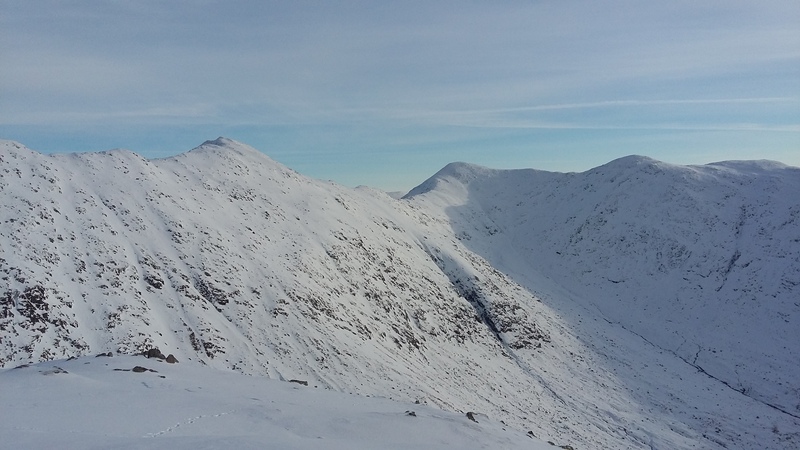 View along the Cruachan Ridge from Meall Cuanail: Drochaid Ghlas in the middle background, Stob Daimh in the background. 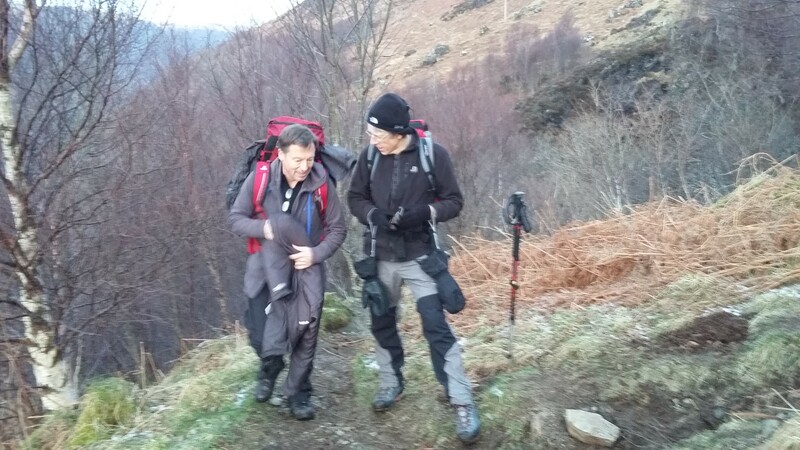 I don't realise but Dr Frank and Chris stop to don crampons at this point - the snow is just beautiful! 20160226_092515. View from the summit of Meall Cuanail looking down to Bealach an Lochan, between it and Cruachan. 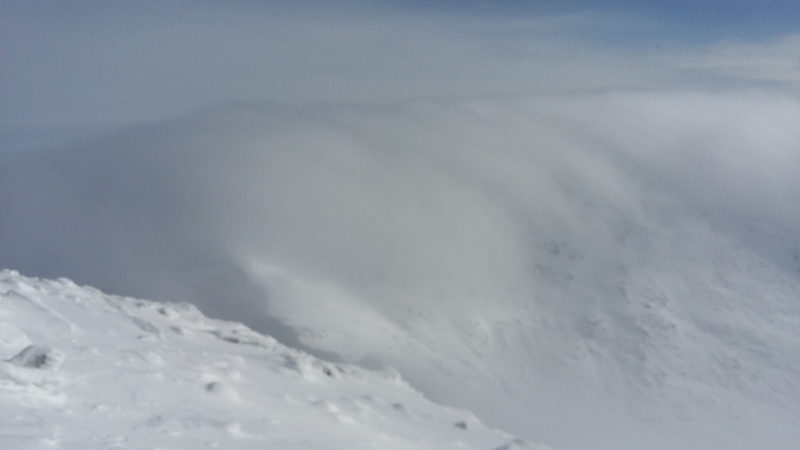 Some decent cornices there. It's a light and easy semi-run down the thickly snow covered ground to the bealach. 20160226_092530. And the ascent to Cruachan.... It doesn't look it, but there's just over 300m of ascent to the summit! Note again: the skies are still completely clear of cloud. 20160226_093237. 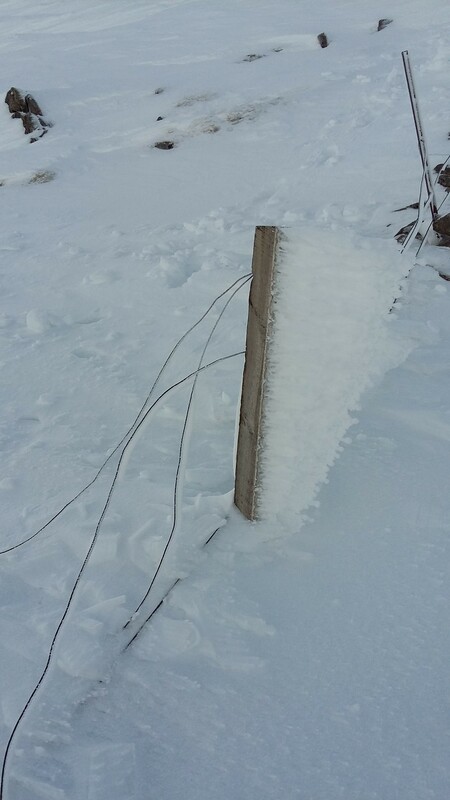 Some spectacular fence post rime on the way down the slope. 20160226_094015. 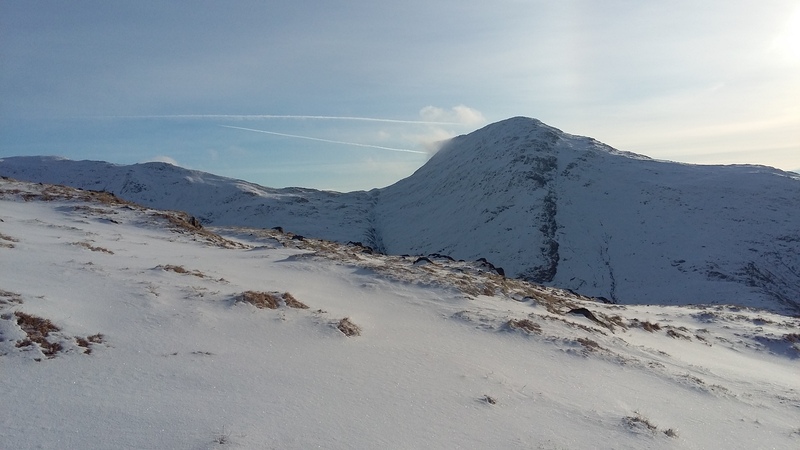 Looking back at Meall Cuanail from about a third of the way up to Cruachan. Quite showy from this angle! 20160226_101901. ... cloud!!?? Where on earth did that come from???? 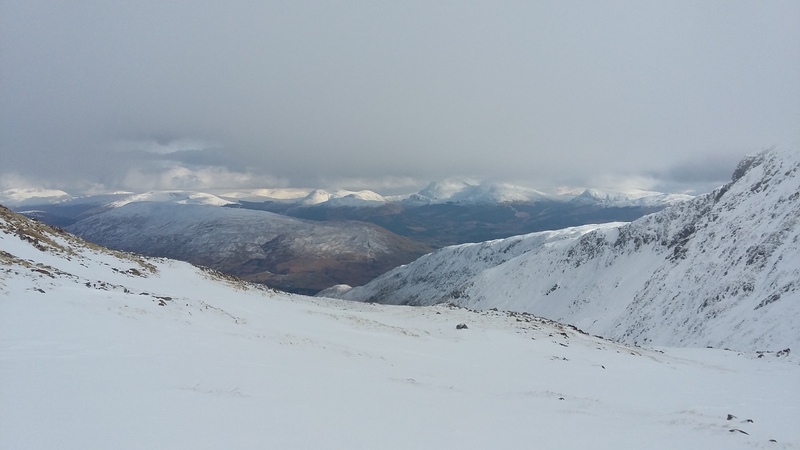 (Looking West from the summit of Cruachan towards Stob Dearg). 20160226_102120. 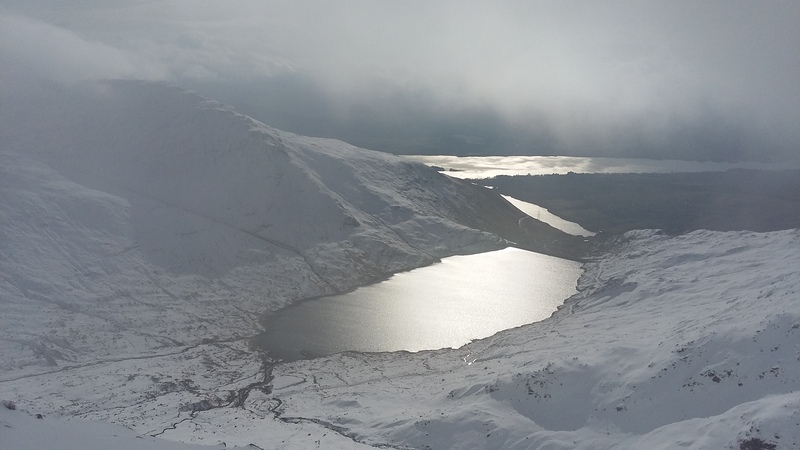 Cruachan Reservoir was in bright clear sunlight moments ago!!!! Chris and Dr Frank have now arrived. While I'm fitting my crampons, Chris gets out the strange orange bivvy thing he was telling me about last night, and after battling with the wind for a while, the three of us manage to get underneath it and sat on the edges to create a kind of tent, with our heads as tent poles. As he'd promised, it keeps off the worst of the wind (we can't quite manage to get the all the edges down properly so there's still something of a chilly draught), and in conditions of enforced orange intimacy, we chew on some food. By the time we've finished and packed away, I'm really cold. 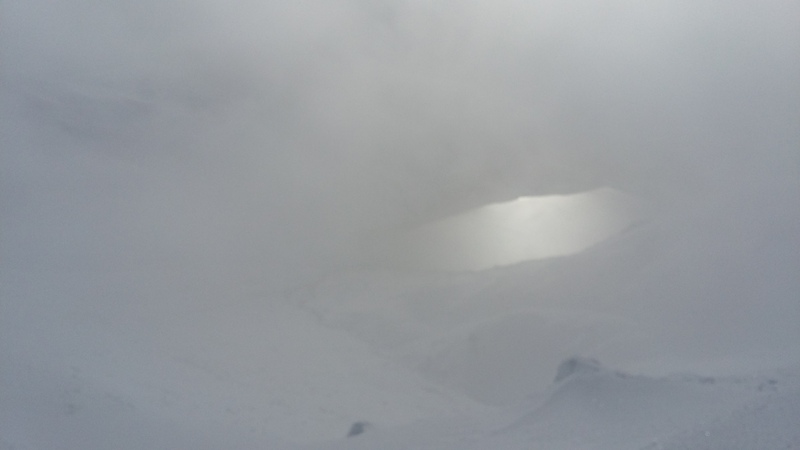 It's blowing pretty hard now, and visibility is very limited indeed. 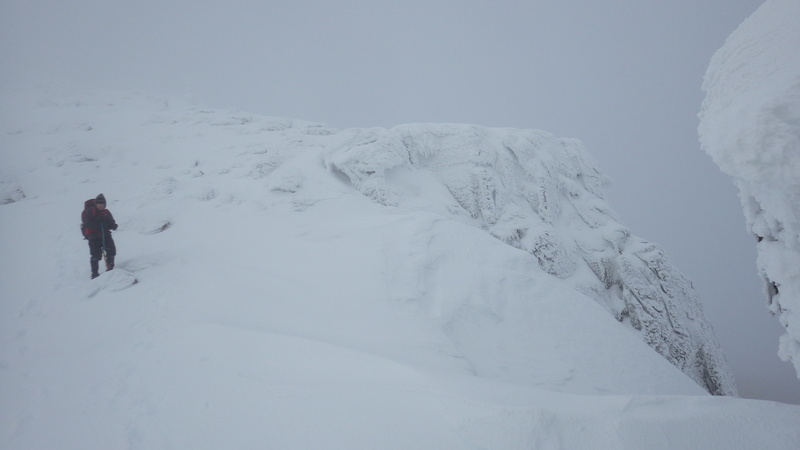 Fortunately someone has been up here reasonably recently and there are prints in the snow - fortunately, because the map indicates an impressively big drop on the North side of the ridge . 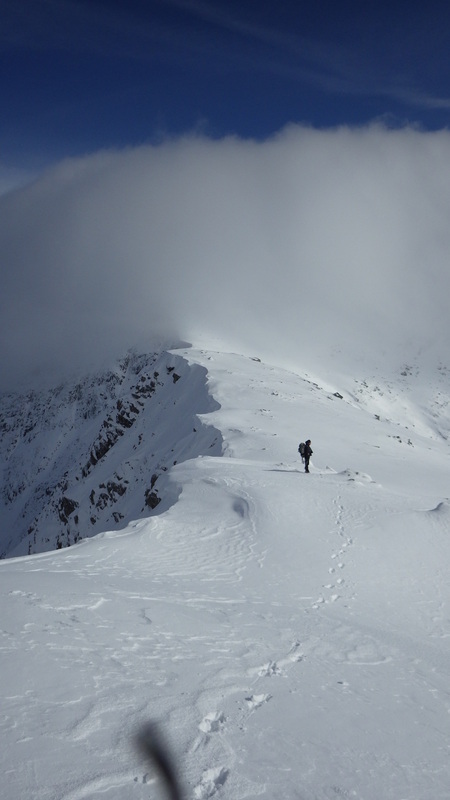 So we set off along the ridge, in pretty good snow conditions. My specs are getting covered in condensation in the mist, so I take them off and stuff them in my pants pocket. We stop at one point - I don't recall exactly why. And as we're stood there fighting the wind and chewing cloud, Dr Frank drops a glove. Now this is one of a pair of absolutely top of the range, blizzard-proof, waterproof, everything proof things; so without thinking, he sets off after it. 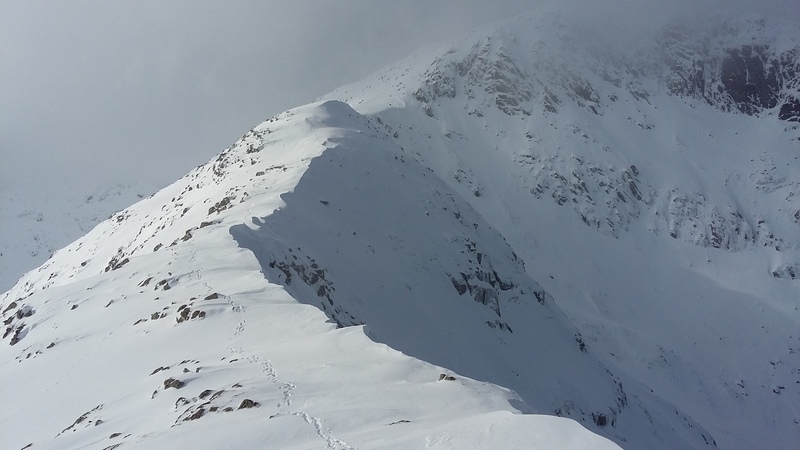 Towards a cornice edge. ... but anyway he did stop. Thank goodness! 20160226_112432. 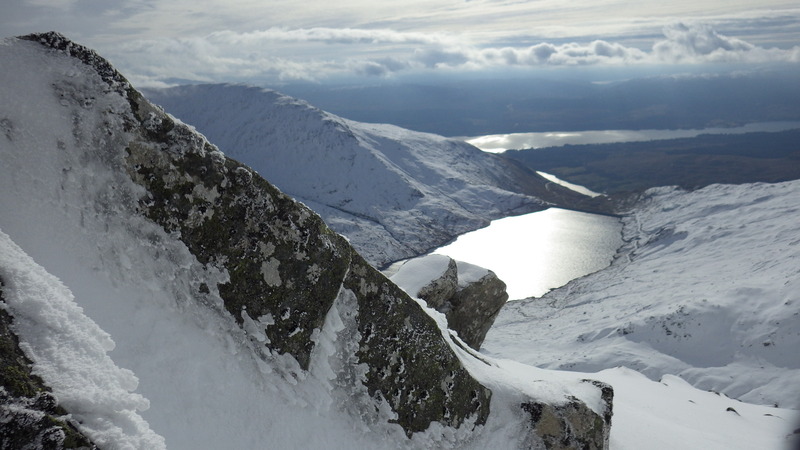 Cruachan Reservoir viewed from the bealach between Ben Cruachan and Drochaid Glas. It's a blessed relief to be out of the thick mist! After re-assembling the multiple broken bits of our dignity and pride, we continue along what is really a wonderful classic (= great views either side) ridge. 20160226_123030. Some of our number get a bit hysterical... altitude sickness...??? As we continue I manage to keep us on the right route with the proper navigational methods (albeit we do stray a bit too far to the East and off the ridge at one point). Eventually I'm really quite touched by the faith he has in this electronic stuff (and secretly quite comforted by the additional navigational certainty it provides). It's quite alarming how unreliable one's instincts are in clag; the only answer I've found is to keep up a continuous sotto voce chanting: "follow the compass, follow the compass, follow the compass...". 20160226_140056. Out of the cloud - orienteering successful!!! View East from Lairig Torran (bealach between Stob Garbh and Beinn a' Bhuiridh. 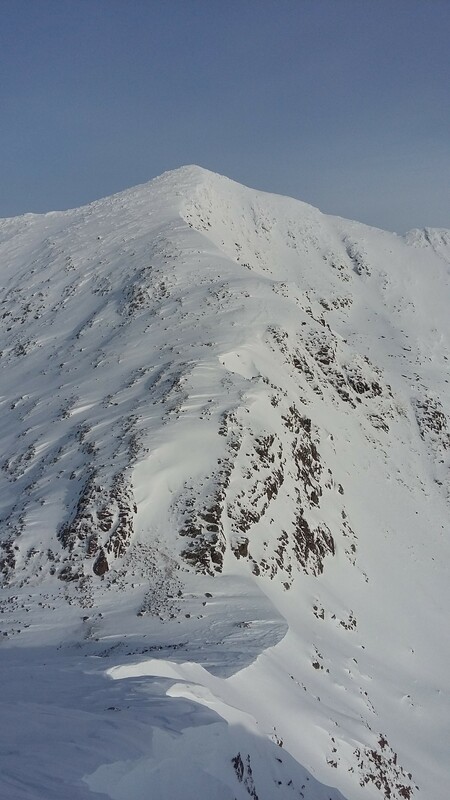 Now there's some 250m of quite steep ascent up the flank of Beinn a' Bhuiridh. As they say, it was all downhill from there. A really excellent start to the weekend . Last edited by Alteknacker on Fri Jan 25, 2019 8:11 am, edited 5 times in total. 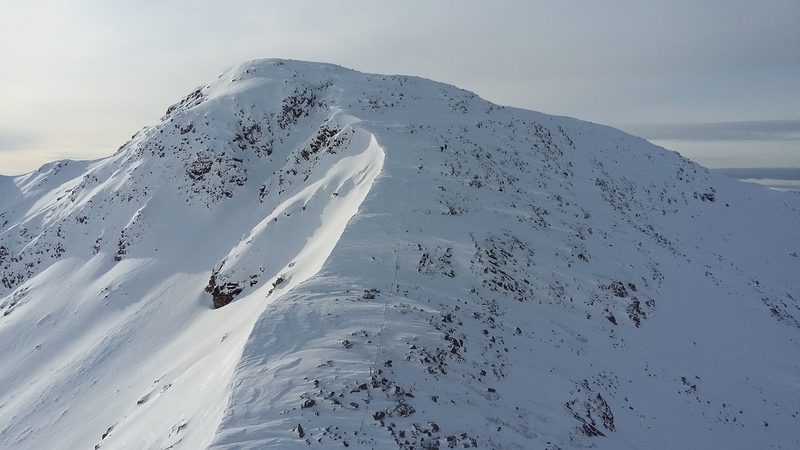 Yes, it's a really fine ridge. 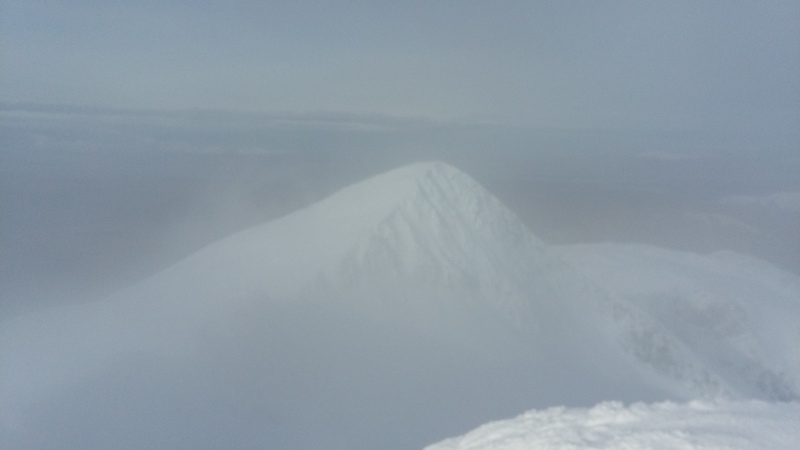 If I was to do it again I would include Stob Dearg to the West, and Sron an Isean, Beinn a Chochuill and Beinn Eunaich to the East, and return to the start via Beinn a Bhuiridh. On a fine day that would take a bit of beating, I think - great views on both sides of the ridge for the whole way . The hill that got me hooked on hills. Can be great to get that sort of in and out of the cloud walk but don't think I'd be in a hurry to dive after an escaping water bottle! Yes, we were incredibly lucky, especially given that, contrary to my normal practice, we'd fixed the date a long time in advance. 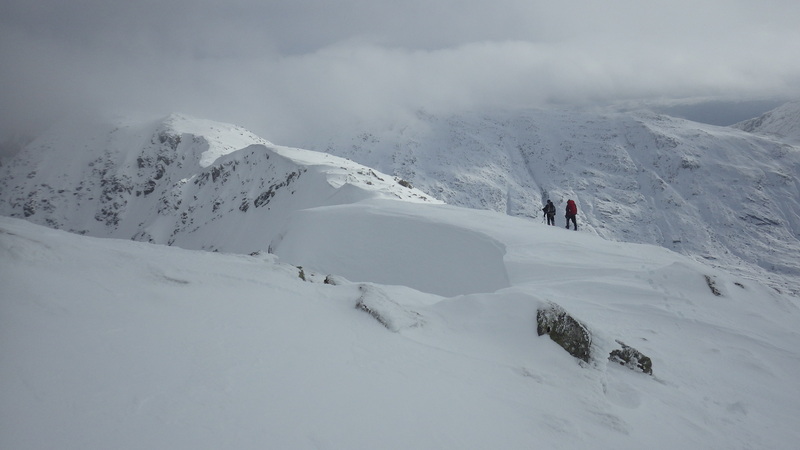 I thought it was a really brilliant ridge (in fine weather, of course). On the other point: I think we could have done with going to a car boot sale after this day!!! Fabulous photos and report - and a bit of excitement to add to the outing with all your 'dropping and diving' ! Thanks for sharing it all. Particularly love the rimed posts. I'm surprised you had time to take so many photos! One of my favourite walks although I did the four hills in two stages. I was lucky with views although the cloud came in and out.